Learn the basic weaves to incorporate into braintwister combos. Weaves: Vol. 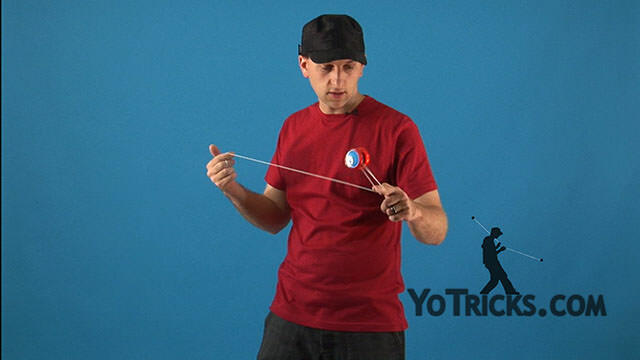 5 Braintwister Combo Series Yoyo TrickThis is the fifth video in the braintwister combo series. In this video, I am going to be teaching you about inside and outside pinwheels, and how to do weaves on your non throwhand and your throwhand. Now, in a previous video, we taught you how to do the pinwheel from your front throw. In this video, we are going to be changing it up a bit, alternating between the inside and the outside. To perform this, you are going to start by doing your inside pinwheel. 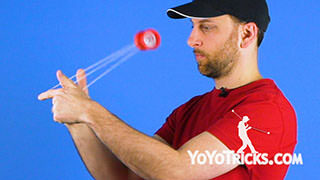 From here, when the yoyo is almost near the top, you are going to point your fist away from your body. This will allow you to perform pinwheels on the outside. 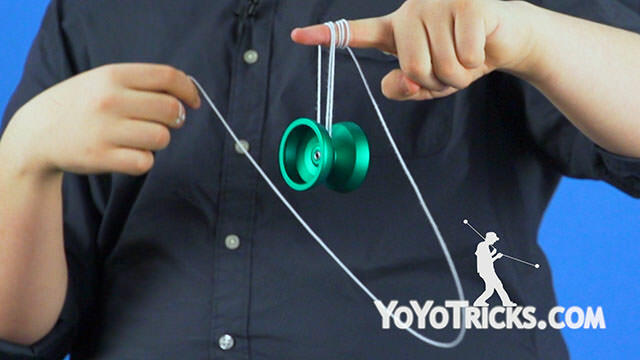 Now, once you are here, to bring the yoyo back to the inside, once the yoyo is near the top, you are going to turn your hand inwards and this should bring you back to the inside. You can then perform this criss cross motion to go between inside and outside pinwheels as many times as you would like. 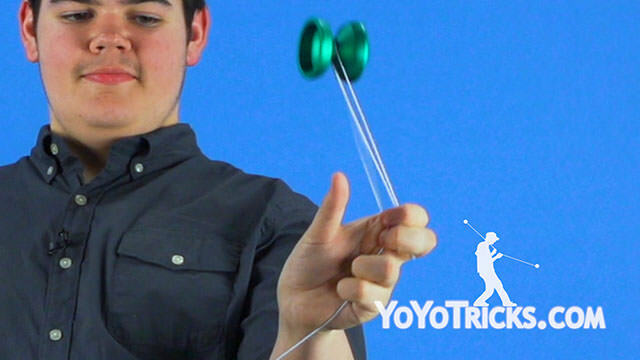 If you are still having trouble with the yoyo tilting on you, we recommend that while performing this criss cross motion, you keep the yoyo as close to either side of your wrist as possible, and that the pinwheels stay in line with the plane of the yoyo. This side to side criss cross motion is a building block for the rest of your weaves. You will want to make sure that you have this one down smooth before attempting to learn the rest of the tricks in this video. 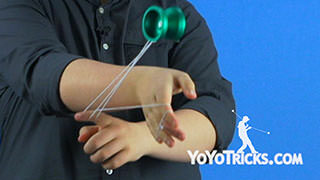 Now, a weave is where the yoyo is mounted on the string and performing this criss cross motion. Another trick that incorporates weaves, you might have heard of it, it is called Revolutions. But that trick is done on the side mount. Now, let us take a look at your non throwhand weaves. For this variation, we recommend using two fingers in the mount. But you can explore and find whatever works best for you. Now, you are going to turn your hand over, facing your palm up. Then you are going to either curl your two fingers in or pinch with your thumb. Either works just fine. The reason that we are doing this is that this locks the string length which will make it easier to control and perform your weaves. Now, you are going to roll the yoyo forward and point your fist away from your body. 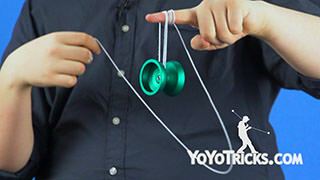 This will transition the yoyo to the outside. You will notice that once you are here, there is a twist in the string. To undo this, you are going to roll the yoyo forward and move it to the inside. Now, once you are here, you can actually just drop these strings and you are back in your front mount. But, the really cool thing about this trick is that, similar to inside outside pinwheels, you can perform this as many times as you would like. Now, there is actually an alternative way to perform this. For this variation, we recommend using one finger in the mount, but once again, find whatever works best for you. 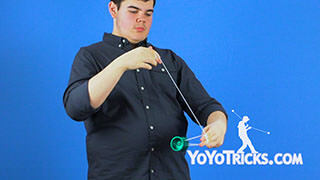 Once you are here, you are going to curl your finger out and around and you will notice that this is locking in the string length and creating a twist in the string. From here, you are going to perform this same criss cross motion, going from the inside to the outside. But once you end up back on the inside, you will notice that there is still a twist in your string. So instead of dropping the string like you did in the previous variation, you are actually going to curl your finger out and around. This will leave you back in your bottom mount. 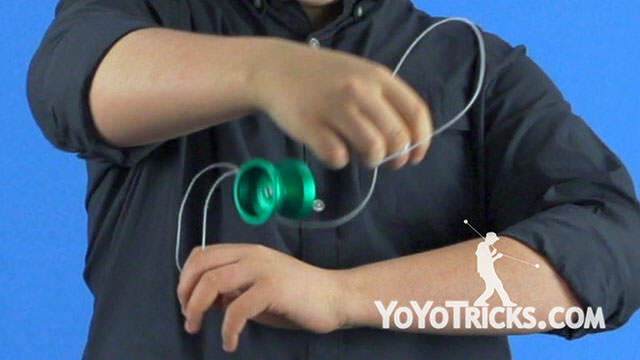 If you are having trouble learning this trick, we recommend that you shorten the loop of string that is going to the yoyo. This will make it easier to control the weaving motion, and make it less likely that the yoyo will fly off your finger. Now, another problem that you might be having while learning this is that there will be a twist in the string when you are finished performing it. All that this means is that you either did too many rotations on the inside or the outside of your arm. Now, if you have too many twists on the outside, all that you need to do is curl your finger in like in the second variation. 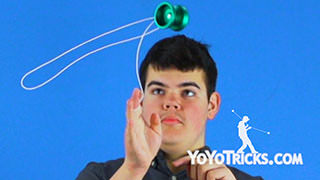 Then from here you are going to roll the yoyo forward and untwist your finger. You actually need to perform a different method to undo too many twists on the inside. What you need to do is curl your finger in like normal. 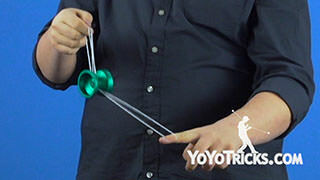 Then roll the yoyo backwards. The reason that we are rolling backwards this time is because the string is actually twisted differently. Once you are here, you will notice that you do have this extra wrap of string around your finger. You can undo it by performing unrolling or for a bit of flare, you can do your manual or your slack unwrap. Now, let us take a look at your throwhand weaves. 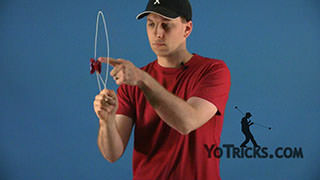 To start this trick, you are going to lengthen the loop of string to where your non throwhand is above your throwhand, or else this trick is not going to work. You are going to grab the string, while learning this we recommend using your whole fist. Then you are going to roll the yoyo forward, moving to the outside. Then from here you are going to perform this same weaving pattern that we taught in the last trick. To prevent any extra twists in the string, you will want to make sure that you do an even amount of rotations on the inside and the outside. Now, once you get this motion down smooth, you can actually perform it pinching with as many fingers as you would like. To dismount this weave, you are just going to let go of the strings that are on your throwhand. This will leave you back in your braintwister mount and you can continue your combo however you like. So, let us take a look at stacking. There are not many options when it comes to stacking within weaves, but lots of tricks flow really well into them. Once you have down the basic weaving pattern, you will notice that you can actually perform weaves going in the opposite direction. This will open up lots of different opportunities such as performing weaves off of outside to string. Aside from that, you can actually perform your non throwhand weaves after performing a few rolls. From here, you can dismount however you would like. 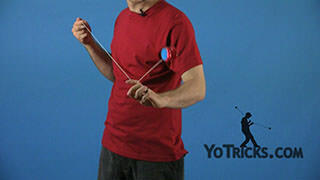 Now, you can also perform both your throwhand and your non throwhand weaves from your double on. Those ones look like this. So, learn these weaves, get them down smooth, incorporate them into your combo with flow, and you are over halfway to creating the ultimate braintwister combo.